The 11th annual Lanterman House Croquet Tournament hosted a record thirty teams, with players coming from all over Southern California and one team traveling from the San Francisco Bay Area. 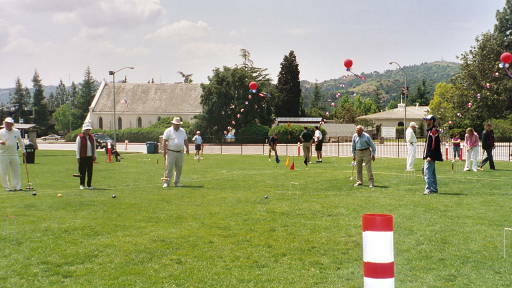 Players in the field ranged from beginners who had never played before to experienced players representing different croquet clubs within California. This was the first year in which the United States Croquet Association sanctioned the tournament. Attendance was helped by a story about the tournament on the local National Public Radio station. The tournament started with 30-minute single elimination rounds on Saturday, May 27th, at Memorial Park. The finals were played the next day on the grounds of the historic Lanterman House, in front of a mixed crowd of croquet enthusiasts and Lanterman House visitors. Divisions were Adult Doubles and Adult/Child. Each team could play in either the Champion bracket (for very good players) or the Open bracket (for other levels of experience). The most intense play was in the Adult Doubles Champion bracket. Three of the four teams in the semi-finals have won this event in the past and have developed fierce rivalries. Ed Therrien and partner Chris Del Guercio advanced to the finals by beating the defending champions Caren and Eric Sawyer. Frequent past champions Steve Del Guercio (Chris’s father) and Jim Kambe also advanced by handily beating past champions John Therrien (Ed’s father) and Anthony Portantino. In the finals, Steve Del Guercio and Kambe both staked out to beat Ed Therrien and Chris Del Guercio in impressive fashion. Nonetheless, the Ed Therrien/Chris Del Guercio team has steadily improved over the years and may soon be a dominant force in this division. In the Adult Doubles Open bracket, the Scott Williams and Phil Gorman bested Linda and Dave Nydam, who were playing in their first finals. Williams has now been on the winning Adult Open team for two years in a row, each time with a different partner. The Nydams have also steadily improved and may be the favorites next year if Williams moves up to the Champion bracket. This bracket also involved the team from Northern California, Larry and Ruth Stotter, who made it to the semi-finals but lost in heart-breaking fashion to the Nydams. The Adult/Child Champion bracket was perhaps the most intriguing. The team of David (father) and Lucas (son) Collins played John (father) and Jordan (son) Therrien in the finals. David Collins is an experienced six-wicket player and the director of the Sunset Canyon Croquet Club in Burbank; his six year-old son, Lucas, is a croquet prodigy and was definitely a crowd favorite. The Therrien clan has also won this bracket in past years. In a display of good sportsmanship, the fathers had agreed at the beginning of the match not to use the opposing son’s ball on runs. The match was close but the Collins team prevailed. 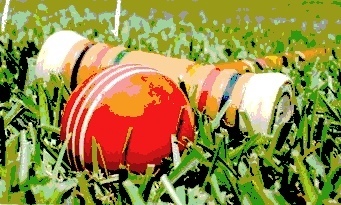 Afterwards, David Collins showed spectators differences in the rules between the six-wicket and nine-wicket games and invited everyone to come play at his croquet club. Finally, in the Adult/Child Open bracket, Steve Del Guercio, playing with his daughter Cami, claimed his second victory of the day, defeating Jim Kambe and his daughter Lauren. The tournament is indebted to Bob Moses, who served as head referee; the generosity of Mr. Richard Dewey of the Croquet Sport Company, who has donated croquet equipment to the tournament many years in a row; and the USCA for sanctioning the event and providing logistical support.